Everyone should have FIESTA dinnerware in their home. 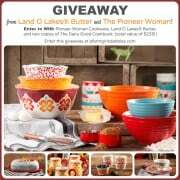 Here’s your chance to win eight 4-piece place settings! Being able to share my love of FIESTA dinnerware with you is something that makes me so happy. 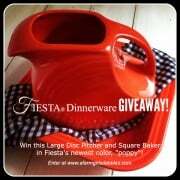 Thank you, FIESTA, for offering this awesome FIESTA Dinnerware Giveaway to celebrate the 5th blogiversary of a farmgirl’s dabbles! My family has been using FIESTA dinnerware daily for a few years now, and I have only wonderful things to say about the quality and functionality of the pieces. They are so well made. None of our pieces have chipped. None. And I appreciate so much that FIESTA is made in the USA, and microwave, dishwasher, and oven proof. We have a multi-colored set that is our “every day” dinnerware, comprised of scarlet, sunflower, lemongrass, and turquoise, with both the larger Java mugs and smaller cups with saucers. You’ll also find various pieces of bakeware, pitchers, platters, and serveware in our home, in a variety of these same colors. It’s like finding a rainbow every time we open the cupboard, so much fun! Here’s your chance to win FIESTA of your very own! Winner gets to choose the color! Disclosure: A great big thanks to FIESTA for providing this giveaway prize. I have some in mix and match, I’d like to add th= new Sapphire and Scarlett. I would choose either the lapis or plum. So many pretty colors, it is hard to decide. I love them all!! But lemongrass, poppy, cobalt and tangerine are beautiful! I left a whole stash of old and new torqouise with a tired ex once… maybe there is something closer to plum in my future? turquoise, poppy, sunflower and cobalt blue! Ivory, paprika and chocolate please! I currently have Cobalt and Sunflower and love them both! Sage or Slate or maybe four of each? I don’t have any dishes so I am not picky. I am drawn to the turquoise or the burgundy. I like the Lapis and Turquoise. I’d love to mix those. The sunflower color just makes me happy! I can imagine it lifting you into a better mood to see that on your table everyday! Tough choice but I pick the poppy color. So many colors to choose from! Not sure which I would choose. Paprika! Vibrant and lovely color that would look great on my table. I love the Shamrock color — it would look great in my dining room! I love the turquoise and the slate. They would look gorgeous together! I like the Sunflower color — would be nice for summer. I want to collect all the colors! Cobalt, lapis, peacock, and turquoise are my favorites. I think I love the Peacock! The Peacock would go well with my decor. So many to choose from, but I think I like Turquoise a lot. Like the peacock or paprika. They all are pretty and would look good on any table. I struggle to choose between peacock and turquoise! I would mix my colors up! Probably some turquoise, some lemongrass, some white, and ….. I don’t know!!! I’m loving the lemongrass and sunflower. Thanks for the opportunity!! I like sunflower and lemongrass! I would like all the colors if I could but I especially like Turquoise and Lemongrass. I love the turquois and the lapis..and the poppy and the… They are all awesome but I am partial to the blues and the oranges. I am crazy about all the colors! Currently living with my in laws until July, so if we won this would be amazing! My mother in law has various colors of fiesta ware, but not the scarlet and I love the scarlet! It is so classy to me for a kitchen set. I like Poppy but would also want white before adding more colors! Love, love, love cobalt, with maybe the white for an accent. Love the Shamrock paired with white. Two simple clean colors of mine welcoming spring. Right now my favourite combo is Scarlet and Lemon Grass. They are all so beautiful!! I’m in love with Peacock and Sunflower! Sunflower is my absolute favorite!! I love the Lapis with the Lemongrass! It is a hard choice, but I would pick paprika. I think the prettiest colors are cobalt, plum, scarlet, & paprika. I love the lapis, tangerine, and paprika but if I had to choose one, I’d choose the lapis. Love the turquoise, poppy, peacock and the cobalt blue! I have cobalt, sunflower and plum. Love these dishes!! I would love the scarlet.. Thank You. I love peacock, plum and sunflower! I love all the colors, but really love the turquoise! I would love to have any of these. I love the scarlet color and the the plum color. Just beautiful! It’s SO hard to choose! I think I would start with turquoise, and add lemongrass, cobalt, and flamingo! It’s so hard to choose! I think I’d pick scarlet. I like the sunflower and tangerine mixes you put together! Peacock is lovely. But so is sage. And sunflower. I’m having trouble picking a favorite! Usually, I’m all about white dinnerware. But I’m kind of mix-and-match when it comes to Fiesta. All the blues and yellow/oranges and greens, but Peacock and Sunflower if I must narrow it down. I like the Scarlet best, Lapis second…. I think the Lemongrass and Tangerine are very nice, but they are all beautiful! Lapis. So pretty and bold. Love them all — but would choose paprika. I like scarlet and sunflower. I have yellow, navy, chartreuse, and salmon but would love either red or charcoal or white!! This would be such a blessing for us! We’d either go with a combo of Turquoise, Scarlet, Sunflower, and Shamrock OR Turquoise and White. It’s hard to decide!! They are all so beautiful and vibrant. If pressed to choose a favorite color, though, I would pick the tangerine. I love the turquoise, sunflower, tangerine, scarlet, lemongrass, shamrock, cobalt and peacock! I’d choose Lapis. Thank you for the giveaway!! I do love purples, but as I move around a lot, sometimes neutrals are a bit more practical! The turquoise is so lovely!! Lapis and Poppy are my faves! We already have some colorful dishes so now we are looking to get a bigger unified set of white dishes. Hopefully my entry went through! I’d choose A mixture of Poppy, Lemongrass, Lapis, and Tangerine! I Like The Lemongrass And Sunflower Colors. I really love the Tangerine and the Poppy colors. But they are all so bright and beautiful I would be happy with any color. I love the turquoise and the Scarlett! So pretty! I think it was called lapis. Love the white and green! Lapis! Beautiful…thank you so much! How in the world do you pick just one color? I would start with Poppy, but how could I overlook Lapis, or Sunflower, or Tangerine, or Plum, or Shamrock? I LOVE the Fiesta colors! I like the lemongrass color the best. What a great way to brighten up the kitchen! I LOVE poppy, sunflower, and lemongrass. So hard to choose! I love the Plum, Lemongrass, Sunflower & Turquoise. So Beautiful! Thank you and Fiesta Ware for the chance. Red would be my choice or the yellow. All the colors are so pretty but I think Plum is my favorite. Scarlet ot Sunflower. I can’t decide!! I love anything bright RED but in honor of my MOM who is no longer here – the Lemongrass just hits me square in the eye. It sings to me. She used to say to me all the time her favorite color was LEMON YELLOW! I just love the hunter green ones the best. and the orange ones. I love Peacock, Sunflower, Lemongrass, and Tangerine! How fun to have a mix of colors and mix and match it all! I’m all about scarlet, but they all remind me of my 1940’s childhood – no matter what color. I love reds so I’d have to choose Scarlet. Lapis and Cobolt Blue!! Love them both! I am torn between the lapis and the cobalt blue. I think lapis is probably what I would choose. I love all the colors but I would want the paprika color, the color matches my kitchen perfect. look great on my table. I would love the Lapis; I think it’s a “WOW”! Could I get an assortment? The table will look so festive! Love all colors. if I have to choose one it is teal. Lemongrass………or peacock……..or poppy……They all are so pretty! I would love the white because it would go with anything and any season, love love me some Fiesta ware, my late Momma had a set in a harvest color..It lasted for years..Love me some white and I love the mugs, I sip tea and read your blog early each morning..thanks for the great blog and giveaway!!!!!!!!!!!!!!!!!!!! I love the Peacock most, I think, but turquoise is also yummy, and so is lapis! It’s SO hard to choose! I love the blues! Cobalt is my fav! Thanks! I would LOVE the scarlet. I’m gradually acquiring red cooking and bakeware. Scarlet or white. Or cobalt. Ivory… Sunflower… Turquoise… So many lovely colors, but it would probably have to be one of these three. Turquoise has always been my favorite, but I would love to get multiple colors! Turquoise or Sunflower…..hmmm, hard to choose. MMMMM – peacock and something else bright to contrast! Having a hard time deciding between paprika and sunflower. How about both!!! gorgeous!!! No way to choose, all beautiful, like my daughters! cobalt blue is my favorite out of the nice list of colors. I like the Peacock color the best. I like the cobalt, plum and white. I would love to have the Cobalt Blue. I’d probably pick what, but that peacock is such a fun color. I’m not positive but I am leaning towards Plum or White. I really like the sunflower color the most. I love the paprika and sunflower the best. Oh i can’t choose… either the scarlet or the sunflower! I only have white, I am ready to go bold and pick out some awesome colors! I love the turquoise & tangerine! Peacock…and Tangerine………and turquoise………and ……….. I like them all! They’re all beautiful! The white is just so classy. Love ALL the colors! Would choose turquoise, peacock, lapis, scarlet, sunflower, lemongrass, shamrock, and paprika…these colors would make a “Happy Table”. I love most of the colors as they are so fun, but I would go with the tangerine, but also love the poppy. I’d pick Plum! It’s fun and would be a conversation starter for sure! I would love a rainbow of Fiesta! Plum, poppy, turquoise, tangerine, sunflower, lemongrass, lapis and parika. What a delight it would be! I love all of the colors, but I think I would choose plum, lemongrass, sunflower, tangerine, and lapis in some combination. Thank you for the giveaways! I want to add the Scarlet to my dark blue set. today my favorite color is turquoise…. thanks for the chance to win! I love them all and already have an assortment, but if I have to pick just one color, it would be plum. not picky.. but really like the sunflower color. Gosh, I really love the turquoise and the tangerine. But white is a classic choice. I like the shamrock green. Gad what an impossible choice—-turquoise or plum or tangerine??? When I win I will make that decision. I love the colors a lot. I love a lot of the colors, but I think I’d chose Sunflower (or peacock or shamrock . . .) :) There are so many cool colors. such a hard decision on color choices. I think poppy and lemongrass would be fun additions to my collection. I originally said lapis, but I changed my mind….sage and ivory would be a beautiful combo! Oh wow! So many pretty colors that it’s so hard to choose! I am torn between shamrock and turquoise! Love the peacock color! And you can never go wrong with white, either. I love the “new” White! I love all the colors. They are so vivid and beautiful! I love to entertain friends and family. The table scape and themes are very important to me. Everyone looks forward to it! I love color and brightness when it comes to entertaining. The peacock and lemongrass are beautiful! My favorite is either the ivory or white. I have a purple dining room, so I would definitely have to choose the plum! Congrats on 5 years of blogging, that is so awesome! Lemongrass. Happy 5th bloggin anniversary! I really like the peacock color! Poppy!! I need that addition to my colors! Congratulations on 5 years! I love these pretty dishes! Peacock and turquoise are my favorite! White! So simple and classy! I love the plum but white is lovely as well. It’s always nice to have a good white set of dinnerware! I love poppy and lapis! Fiesta colors are simply gorgeous, and choosing is not easy! But I love the Lapis, and the Scarlet, and the Sunflower, and the Peacock. All colors are fabulous my favorite is turquoise!!! I LOVE the tangerine AND the sunflower colors!! So pretty! So bright! So cheery! All so lovely. I’d choose sunflower. Or maybe white. But peacock and lapis are amazing! I love the cobalt blue…though it’s really hard to pick just one! My friend has a “rainbow” set, if you will and I would love to have that! But I think my favorite color is probably the turquoise! I love the tangerine and the lapis! I really like the white as well. I think it is best for photographing food. A mix of tangerine, lemongrass, turquoise and sunflower would be great! I love the Sunflower yellow but if I won I might choose white. I have quite the collection of colors but LOVE your idea of having a set of white for when you want a more uniform table setting!! Black would look great on any occasion! I love the new peacock,also adore the shamrock,sunflower and turquoise ! Poppy!!!! Peacock !!!! Lemongrass !!!!!!! The Plum is my favorite–so beautiful! Love Fiesta dinnerware! Scarlet-Black & White would be wonderful!!! I’d love a mix of colors to add to my small collection of Fiesta plates. I would get a Multicolored set! Poppy, lapis, plum and cream! I’d love to add some more colors to those I already have: maybe lapis, poppy, …! The red and the white to go with my farm themed kitchen! I would love to have the Paprika in my kitchen! I love poppy and turquoise! So many lovely colors. But I would choose Paprika, Yellow, and maybe a blue. I love so many of the colors! My favorites are tangerine, lemongrass and sunflower, I think. I love poppy and cobalt blue. Congratulations on you 5th anniversary! I would love to win a Scarlet set, thank you for the opportunity! I love the Sunflower color….I think it would be pretty when the food is on the plates! So many lovely colors — love the sunflower and the peacock makes my heart swoon. I would love to have almost any of the colors except for the white. I love lemongrass & turquoise…reminds me of my childhood! All the colors are vibrant. I love the Peacock blue the best! I love the lapis and peacock!! Cobalt? Peacock? Tangerine? I would choose an assortment of colors! Turquoise. 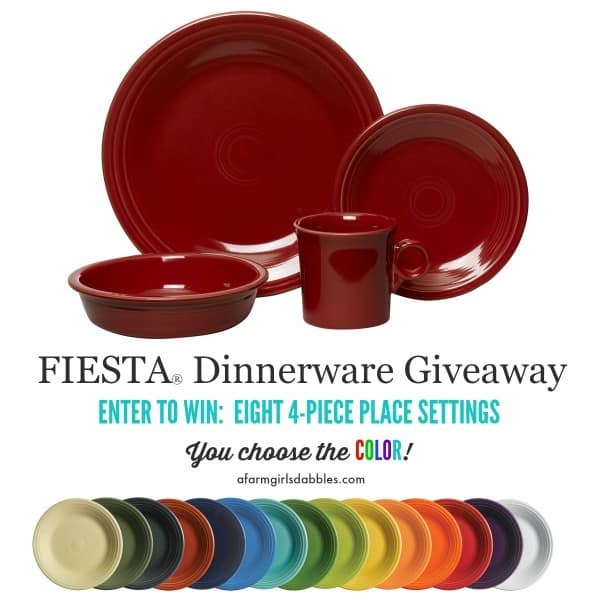 I love that color and would love to win this fantastic fiesta set! I’m having a hard time choosing one! I love the sunflower, but I also really like paprika too. I’m liking the Sunflower & Lemongrass colors the best! I love them all. I have a mixed set so I’d probably choose the white which is more to my husbands liking. I really like the white, cobalt, shamrock, lapis, and lemongrass! I like peacock best, but I think it is fun to mix it up with assorted colors. Although i love the brilliant colors, I’d choose white. Food is the art. So hard to choose, but I like lemongrass, peacock and poppy. I’m usually so indecisive but this time I positively love the Shamrock. I love Poppy the best! I love them all! Beautiful colors! Especially the cobalt blue! I would love a mix of turquoise, lapis, plum, and white! Poppy and plum would complement my current Fiesta collection nicely. I love my Fiestaware! I like the turquoise and the lemongrass. Love all the shades if green but also the cream and basic white. All so pretty! If I could get one color it would be Poppy. Thanks for the chance to win. Love the peacock, turquoise and always White colors. Thank you. Paprika…love it and it ties in with my accent colors in my home. Hard to pick just one as I love them all! But most crazy about plum or lemongrass! Wow! I would have to go with multi-color & take one each of the scarlet, tangerine, sunflower, lemongrass, peacock, lapis, cobalt & plum. I love ALL the colors! I have a few pieces of ORIGINAL Fiesta from the 30’s & 40’s that I inherited, a couple of platters from the 60’s, and 4 ‘lavender’ dinner plates that my sister gave me, but no complete sets of anything. Would LOVE to win this. If I had to choose a single color to win it would be the poppy. If I could choose 2 colors they would be plum & sunflower. If I could choose 4 colors they would be poppy, peacock, plum & sunflower. Or heck! How about 8 different colors???? I would love the scarlet set of this great dinnerware. I love the turquoise & lemongrass combination! I would choose the scarlet. Love all the colors!!!! I love the scarlet red!!!! I love the scarlet but the peacock matches the Fiesta I already have. I’d love that bright red! Happy Anniversary! Thank you for your great recipes and inspiration! I love the Sunflower color. My choices would be turquoise, tangerine, sunflower and lemongrass. I would just love to have these cheerful colors in my kitchen! I’ve always wanted Fiesta dinnerware because my mom had it way back when I was a child and she had a mixture of colors too! I like ivory and scarlet best, but there are so many beautiful colors it’s hard to choose. I love the poppy color. I would mix the colors but Tangerine would be at the top!!! I love the plum and cobalt blue. They’re so rich and deep. Then there’s the scarlet and the black. I love the dark tones. My favorite is cobolt but my wife wants paprika. She has a big 5-0 birthday coming up in May and it would be great to win these for her. I love the Black set and also the Ivory. I love all of them, but if I have to choose a color it would be Tangerine. That Poppy color would wake us up in the morning. I really love the lemongrass and the turquoise! Such happy colours! My favorites are the darker green shade and yellow. The lapis made me “ooh” out loud when I clicked on it. That would be my choice…although white is very, very tempting since it’s so practical for all occasions/parties/etc. The lapis is so pretty! Congrats on your Dabble -Anniversary and thank you for the FUN give away. I always enjoy reading from a little of your wisdom! (I love the happy orange Fiesta dinnerware, by the way.) God Bless! Poppy, Peacock, Lemongrass, all of them! I like Lapis and Cobalt Blue best. I love the multi colored set or plum and lemongrass. Too many to choose! I already have pieces in lapis, turquoise, plum, peacock, and sunflower…but a good set in white would make a great base to add pops of color. Scarlet to use for hosting Christmas, Valentine’s Day, Memorial Day, or 4th of July!!! Lemongrass, Peacock, white, I’d love to start with these colors, please let me win! Peacock is so vibrant. I’d love to gift my mom a multicolor set. i love the turquoise! Please! Although my personal pick would be the turquoise, I’d probably choose the white and mix in some colored pieces as accents. I like any of the blues, the scarlett and the white. LOL. I like the big mugs too. I like lapis or peacock. I LOVE the mix of colors, and think the lemongrass, poppy, tangerine and turquoise are my favorites!!! I honestly can’t pick one color. I already own several pieces and love having a mix of colors. There’s always one that looks great to make your food come alive. My favorite will always the be the scarlett, but I really love them all!!! I love Poppy the most… but would really love an ecclectic combo of colors… mix n match…. the bestest!!! turquoise! although, i wouldn’t be opposed to owning some of every color. they are all gorgeous. thank you for the giveaway! Tangerine would make my day! So bright and beautiful! Plum is beautiful! Thanks for the giveaway. I love the plum color! So pretty! I’ve been wanting to get the lemongrass since they introduced it! 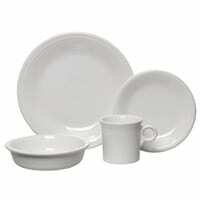 I have been wanting ivory Fiesta dinnerware foreva! Great giveaway! Love them all! Can’t wait to see the new colors for this year. My natural inclinations are peacock blue and plum. But if I won, I might choose scarlet, just so I’d have something better for the occasional food photo. Paprika! Or sunflower! Or classic ivory! I have been loving these dinnerware dishes for years now. Geez, so many pretty colors. I would have to say my faves are lapiz and ivory! Plum is my fave, but they are all gorgeous! Colbalt. I heart Fiesta wear! I love the plum and peacock! If I had to pick just one, the shamrock is calling my name. But I love the pop of color in the paprika too! I need the sunflower! And the peacock- I love mixing Fiestaware! I love the cobalt blue and the shamrock! Turquoise and lapis, I need these colors for my collection. I love the Peacock color! It is so hard to chose just one. I love sunflower though. So many gorgeous colors to choose from but I would go with turquoise, shamrock and lapis. Plum, turquoise, and peacock are my favorites. All the colors are fabulous! Oh tough – but I like to go basic/classic with ivory or white! So many wonderful bright colors! Lapis or Plum or Poppy or Sunflower! I’d have to have a combo. I like scarlet, lemongrass and peacock……..would like to see some of the vintage colors brought back too! 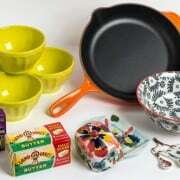 See I want to win this for my friend as she *loves* Fiesta ware. So she would need to pick the color. I want the Fiesta dinnerware in Lemongrass! I love the cobalt blue and the sunflower! Was just thinking I need some new dishes…. I just decided I really like the paprika best. I love the scarlet the best! Hard to choose so SCARLET. I love the scarlet, and would love to mix in some lime and/or turquoise. I love all the colors but my favorite would be turquoise. I’m not sure why, but Fiesta dinnerware looks so amazing in bright colors. I’d have to pick red or tangerine or teal! Love, love, love the scarlett! All the colors are great, leaning toward the basic black and shamrock combination. Tough to choose but I think I would love LEMON GRASS, gorgeous colors. I love all the colors but the lemongrass will go best with the green accents in my kitchen. I really would like to do the rainbow of colors like you did! The white or the ivory. I think food just looks better on a neutral plate. How do you pick? They are all beautiful. I would probably choose the sunflower. Beautiful! Love the combination of shamrock & paprika!! All are great colors!! They are all nice, but I’ll pick the turquoise. Thank you Brenda. Love the peacock! Great Spring giveaway – thank you! That peacock color is breathtaking. Love it! Green for Spring! Great give-a-way! I love the turquoise and the tangerine! The white is my fav,With different colored mugs,maybe turquiose. Love all the colors & the pitcher is my fav Fiesta add on. So many choices!! I love all the colors and would take any of them! I think my favorite is the scarlet! Touch choice. Peacock or Scarlet! The settings on my monitor don’t do it justice but I love the lapis color in person. Love the Peacock and Lemongrass. Love the colors and how they all seem to work together in combinations. I love them all, but we just redecorated our kitchen using teal accents, so I think I would have to do the teal! I would pick the white and maybe throw in some of the gorgeous grey! I really like the scarlet color. It goes well with our kitchen decor!! I love the plum, peacock, cobalt, lapis, shamrock, paprika, poppy, all of them really! I love rainbows! It’s a tough choice because I love them all! But I would probably choose Tangerine! I’ve got a yellow, lime green and orange theme for my kitchen going on right now – I think those colors would look beautiful together! I like the turquoise color best.